Nasrin Mottahedeh was born and raised in Iran. After she received her BA degree in psychology she continued her education in journalism in England. Then she returned to Iran, finishing her education in broadcasting, and began to write professionally. Along side writing articles for children and adults, she started producing family shows and literature programs on Iranian National Television. Her show, "A trip From Spring to Paradise", was nominated and chosen for the best TV show in 1976. After she moved to the United States with her husband, she started the publication of "ZAN Magazine" for the Iranian community. This magazine was very well-loved among Persian writers and families. Nasrin is extremely creative with a brilliant sense of humor that reflects well through her work. Ice Dream's Wish is her first Children's book. Nasrin is working on her next book, a novel that presents her wonderful humor with regard to children and family values. Ice Dream's Wish by Nasrin Mottahedeh tells a tale of the snowman known as Ice Dream. When Ice Dream was created, he was given special gifts which consisted of two sparkly marbles for eyes, a red rose bud for a heart, and a big yellow apple for a brain. With these special gifts, Ice Dream came to life and loved to play with the children, but he was easily bored when they were at school because he did not have legs and could not move from where he stood outside. Ice Dream is visited by Angel Cloud, an angel who grants him his wish to be able to move. Ice Dream questions how the angel had known his strongest wish and is told that angels live inside your heart and know what you wish for. Angel Cloud warns Ice Dream that he must use his special gifts – his eyes, heart, and brain – if he is given the power to move. During Ice Dream’s first journey, he feels so inspired to help others that he gives up his nose, his gloves, his scarf, and the beads on his front which look like the buttons of a jacket. Unrecognizable to his creators, they are amazed to find their special gifts in the snow at the school yard, looking absolutely radiant as they had been touched by love. I found this tale to be absolutely extraordinary. Ice Dream’s Wish is a book that teaches so many lessons in life – lessons about kindness, friendship, helping others, being unselfish, and daring to dream. Due to Ice Dream’s kindness to strangers, human and animal alike, he made their awful day turn around and shine. Many people could learn from this delightful children’s tale of love and of thinking about others’ needs before their own. Nasrin Mottahedeh’s story makes me smile, giving hope for a better future. I look forward to reading more of her books in the future. When three children build a snowman they each offer him one special gift which magically gives him a life all his own. Their snowman possesses, above all, the gift of compassion. One day he is granted a special wish by an angel. But Ice Dream, the snowman, selflessly uses his gift to shower others with kindness, even at great expense to himself and his very existence. 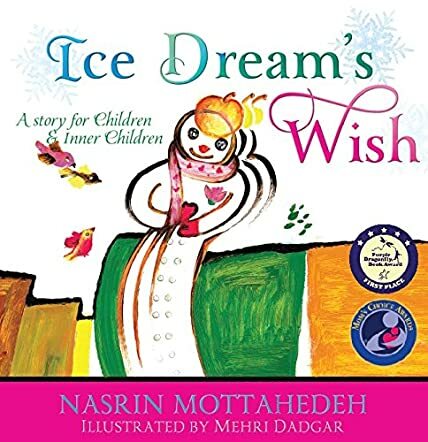 Ice Dream's Wish, by Masrin Mottahedeh, is a lovely tale which teaches children that when you give of yourself the rewards can be immeasurable. Ice Dream's Wish is highly recommended. I first became familiar with this book several years ago when the author and illustrator were first putting the concept together, and I was happy to offer a few suggestions. Imagine my delight to see that this beautiful and charming book has become a reality. This is an absolutely lovely and uplifting children's book with a truly positive and moral lesson for people of all ages. I cannot say enough good things about the story, the art work, and the inspiring message woven into the very fabric of the words and pictures. This book is a joy to read, and beautiful to behold. The perfect book for this holiday season, and for all the seasons to come.